Object: is a bundle of data and its behaviour(often known as methods). Objects have two characteristics: They have states and behaviors. So if I had to write a class based on states and behaviours of House. I can do it like this: States can be represented as instance variables and behaviours as methods of the class. We will see how to create classes in the next section of this guide. Behavior: Break, Accelerate, Slow Down, Gear change. Note: As we have seen above, the states and behaviors of an object, can be represented by variables and methods in the class respectively. If you find it hard to understand Abstraction and Encapsulation, do not worry as I have covered these topics in detail with examples in the next section of this guide. Abstraction: Abstraction is a process where you show only “relevant” data and “hide” unnecessary details of an object from the user. Encapsulation: Encapsulation simply means binding object state(fields) and behaviour(methods) together. If you are creating class, you are doing encapsulation. A single object by itself may not be very useful. An application contains many objects. 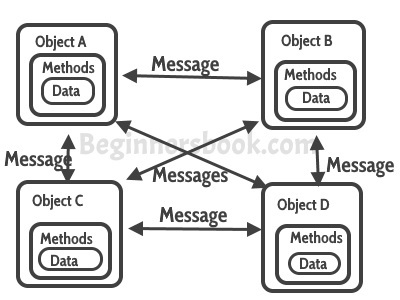 One object interacts with another object by invoking methods on that object. It is also referred to as Method Invocation. See the diagram below. A class can be considered as a blueprint using which you can create as many objects as you like. For example, here we have a class Website that has two data members (also known as fields, instance variables and object states). This is just a blueprint, it does not represent any website, however using this we can create Website objects (or instances) that represents the websites. We have created two objects, while creating objects we provided separate properties to the objects using constructor. If you look at the right side of this statement, we are calling the default constructor of class myClass to create a new object (or instance). We can also have parameters in the constructor, such constructors are known as parametrized constructors. Abstraction is a process where you show only “relevant” data and “hide” unnecessary details of an object from the user. For example, when you login to your bank account online, you enter your user_id and password and press login, what happens when you press login, how the input data sent to server, how it gets verified is all abstracted away from the you. Read more about it here: Abstraction in Java. Encapsulation simply means binding object state(fields) and behavior(methods) together. If you are creating class, you are doing encapsulation. The class EncapsulationExample that is using the Object of class EmployeeCount will not able to get the NoOfEmployees directly. It has to use the setter and getter methods of the same class to set and get the value. Well, at some point of time, if you want to change the implementation details of the class EmployeeCount, you can freely do so without affecting the classes that are using it. The process by which one class acquires the properties and functionalities of another class is called inheritance. Inheritance provides the idea of reusability of code and each sub class defines only those features that are unique to it, rest of the features can be inherited from the parent class. Note: The biggest advantage of Inheritance is that the code in base class need not be rewritten in the child class. The variables and methods of the base class can be used in the child class as well. In this example, we have a parent class Teacher and a child class MathTeacher. In the MathTeacher class we need not to write the same code which is already present in the present class. Here we have college name, designation and does() method that is common for all the teachers, thus MathTeacher class does not need to write this code, the common data members and methods can inherited from the Teacher class. Multilevel inheritance: refers to a child and parent class relationship where a class extends the child class. For example class A extends class B and class B extends class C.
Hierarchical inheritance: refers to a child and parent class relationship where more than one classes extends the same class. For example, class B extends class A and class C extends class A. Multiple Inheritance: refers to the concept of one class extending more than one classes, which means a child class has two parent classes. Java doesn’t support multiple inheritance, read more about it here. Now suppose we have two Animal classes Dog and Lion that extends Animal class. We can provide the implementation detail there. As you can see that although we had the common action for all subclasses animalSound() but there were different ways to do the same action. This is a perfect example of polymorphism (feature that allows us to perform a single action in different ways). 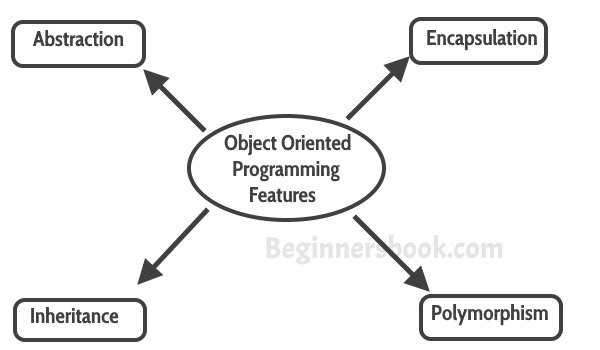 Polymorphism that is resolved during compiler time is known as static polymorphism. Method overloading can be considered as static polymorphism example. Method Overloading: This allows us to have more than one methods with same name in a class that differs in signature. When I say method signature I am not talking about return type of the method, for example if two methods have same name, same parameters and have different return type, then this is not a valid method overloading example. This will throw compilation error. It is also known as Dynamic Method Dispatch. Dynamic polymorphism is a process in which a call to an overridden method is resolved at runtime rather, thats why it is called runtime polymorphism. Since both the classes, child class and parent class have the same method animalSound. Which of the method will be called is determined at runtime by JVM. 1) A method that is declared but not defined. Only method signature no body. 5) Used to put some kind of compulsion on the class who inherits the class has abstract methods. The class that inherits must provide the implementation of all the abstract methods of parent class else declare the subclass as abstract. An abstract class outlines the methods but not necessarily implements all the methods. Note 1: There can be some scenarios where it is difficult to implement all the methods in the base class. In such scenarios one can define the base class as an abstract class which signifies that this base class is a special kind of class which is not complete on its own. A class derived from the abstract base class must implement those methods that are not implemented(means they are abstract) in the abstract class. Note 2: Abstract class cannot be instantiated which means you cannot create the object of abstract class. 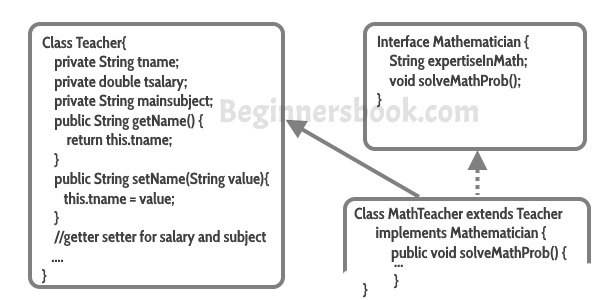 To use this class, you need to create another class that extends this abstract class provides the implementation of abstract methods, then you can use the object of that child class to call non-abstract parent class methods as well as implemented methods(those that were abstract in parent but implemented in child class). Note 3: If a child does not implement all the abstract methods of parent class(the abstract class), then the child class must need to be declared abstract. Here we have an abstract class Animal that has an abstract method animalSound(), since the animal sound differs from one animal to another, there is no point in giving the implementation to this method as every child class must override this method to give its own implementation details. That’s why we made it abstract. Now each animal must have a sound, by making this method abstract we made it compulsory to the child class to give implementation details to this method. This way we ensures that every animal has a sound. An interface is a blueprint of a class, which can be declared by using interface keyword. Interfaces can contain only constants and abstract methods (methods with only signatures no body).Like abstract classes, Interfaces cannot be instantiated, they can only be implemented by classes or extended by other interfaces. Interface is a common way to achieve full abstraction in Java. Interface is similar to an abstract class but it contains only abstract methods. All methods in an interface are implicitly public and abstract. Using the keyword abstract before each method is optional. An interface may contain final variables. A class can extend only one other class, but it can implement any number of interfaces. An interface reference can point to objects of its implementing classes. In order to implement the concept of inheritance in an OOPs, one has to first identify the similarities among different classes so as to come up with the base class. This process of identifying the similarities among different classes is called Generalization. Generalization is the process of extracting shared characteristics from two or more classes, and combining them into a generalized superclass. Shared characteristics can be attributes or methods. In contrast to generalization, specialization means creating new subclasses from an existing class. If it turns out that certain attributes or methods only apply to some of the objects of the class, a subclass can be created. Well, you must have seen public, private keyword in the examples I have shared above. They are called access specifiers as they decide the scope of a data member, method or class. public: Accessible to all. Other objects can also access this member variable or function. private: Not accessible by other objects. Private members can be accessed only by the methods in the same class. Object accessible only in class in which they are declared. protected: The scope of a protected variable is within the class which declares it and in the class which inherits from the class (Scope is class and subclass). Default: Scope is Package Level. We do not need to explicitly mention default as when we do not mention any access specifier it is considered as default. Although we have covered almost all the OOPs concepts here, but whatever we have learned in this guide is in brief, these topics are wide and there is so much scope to learn these topics in detail with the help of examples. Thats why I have covered each and every topic in detail along with examples and diagrams in the next tutorials. How can you read the next tutorials in a sequential manner? There are couple of ways to do it – 1) Tutorial links are provided in the left sidebar, go though them in the given sequence. 2) Go to the main java tutorial page that has all the links to the tutorials in the sequential manner. If you find any difficulty understanding these OOPs Concepts then drop a comment below and I will get back to you as soon as possible. your article so good and simple to understand.Thanks for post these valuable article. One of the best website for beginners.. I got to clear about lot of concept in java from this Article. your site so good and simple to understand.Thanks for post. In java there no access specifiers. We have only Access Modifiers.In C++ we have both specifiers and modifiers. Really can’t appreciate enough the effort you put to explain the concepts and examples so clearly. Hats off..Great job indeed!! i really appreciate the people who made this website…i learnt a lot from this website..and came to know that this is very helpful for me to clear the doubts in java..!! Its a GOOD website for Interview preparation.i can say it is a BEST website for freshers.Thank you.. So simple and so beautifully explained. Thanks a lot. I really appreciate your work. I really appreciate those people who have worked on this. OOP concept needs be learnt like at ease like you have done. it’s indeed a good article to visulize a OOP properly. I always refer to this website when I want to understand a given concept… Your work will live forever! I really fond of your deeds for beginners’. Your efforts and love been really appreciate. I have a small suggestion that it would be so good if you add pictures like stuff to explain the topics. Thank You. I have a question regarding protected access specifier.In this article it’s given that “protected: The scope of a protected variable is within the class which declares it and in the class which inherits from the class (Scope is Class and subclass)”. To my knowledge, Protected means Package level and Subclass level access(in Java). Could you please comment on this.. When I started learning Java Programming Language, I saw it as a very very complex thing. But this post has really helped me. I am enjoying learning Java. Do you have post for other programming languages like C, C++, Python, Pascal? Super post for university assignment! It is a best site to learn oops concept in very simple forms with suitable examples.And the content of this sites is easy to understand for learners. This is a very explanatory article, it really helped. Thanks. I have one suggestion that If there is a way to align the topics in an order to learn then it will be useful for new learners of Java.